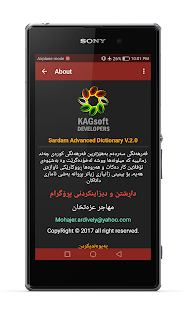 SardamDict is one of the most powerful, fast, smooth and advance Kurdish dictionary which includes millions of words and phrases and works completely offline. It's a fully-featured and user-friendly dictionary. 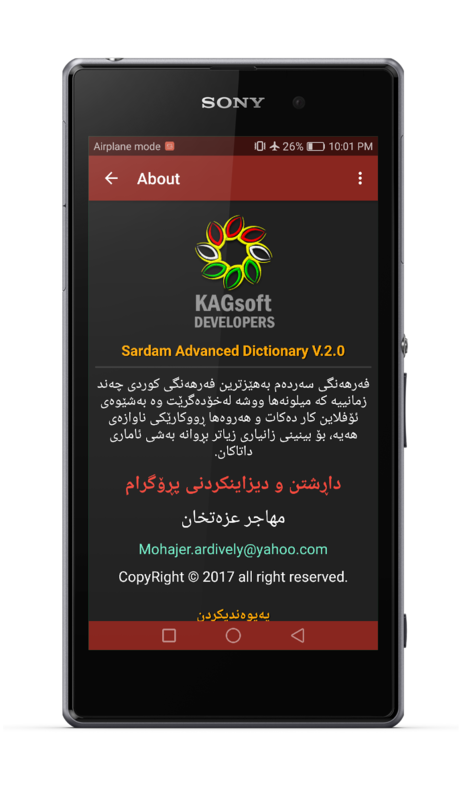 SardamDict includes 20 Dictionaries in 10 international languages, which is divided into two sections General dictionary and Scientific dictionary. 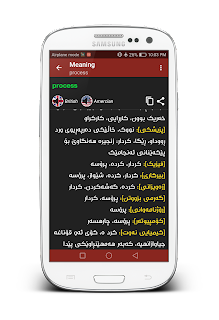 The Scientific dictionary consists of 42 dictionaries in various fields of science and also includes the most complete list of English irregular verbs with their Kurdish meaning and pronunciations of individual words. 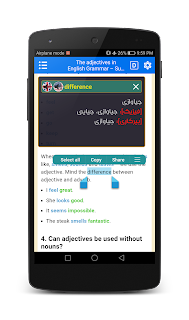 SardamDict dictionary is important for all students, lectures, journalists and everyone who study or research relevant to science and social fields and it helps the users to increase their knowledge’s and study. فەرھەنگی پێشکەوتووی سەردەم یەکێکە لە بەھێزترین و پێشکەوتووترین فەرھەنگە کوردییەکان کە 20 فەرھەنگ بە دە زمانی جیھانی لەخۆ دەگرێت وە زیاتر لە 42 فەرھەنگی زانستی تێدایە وە ھەروەھا لیستێکی تەواوی فرمانە ناڕێکەکانی ئینگلیزی تێدایە لەگەڵ خوێندنەوەی ووشەکان و مانای کوردی ووشەکان. یەکێکە لە خێراترین فەرھەنگەکان و ڕووکارێکی ناوەزی ھەیە و ھەروەھا دوو شێوەی جیاوازی گەڕان بەدوای ووشەکانی تێدایە کە بریتین لە گەڕانی ئاسایی و گەڕانی پێشکەوتوو و ھەروەھا تایبەتمەندی لەبەرگرتنەوەی ووشەکان بە ھەرسێ شێوازی (floating) و (Notification) و (Toast) ی تێدایە. بە بوونی ئەم فەرھەنگە لەناو مۆبایلەکەتدا پێویستت بە ھیچی سەرچاوەیەکی تر نابێت چۆنکە ئەم فەرھەنگە گەورەترین بنکەی زانیاری ھەیە کە بەشێوەیەکی ئۆفلاین کار دەکات بەبێ ھەبوونی ھێلی ئەنتەرنێت. 1. Huge database about 1 million headwords. 2. Offline Dictionary which means no internet Connection required when you search a word in dictionary. 3. US & UK pronunciation and share translated words. 4. 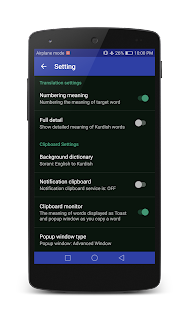 Clipboard monitoring which means copy word in anywhere to get its meaning in three different modes Floating mode, Notification mode and Toast mode. 6. Complete list of English irregular verbs along with their Kurdish meanings. 7. User-friendly interface and easy to use. 9. Display Settings has lots of custom option you can set. Note: If you have installed this dictionary, no need to install any other. Headwords numbers of available dictionaries. 1. English to Kurdish: 130,000 headwords. 2. Kurdish to English: 117,493 headwords. 3. Arabic to Kurdish: 72,828 headwords. 4. 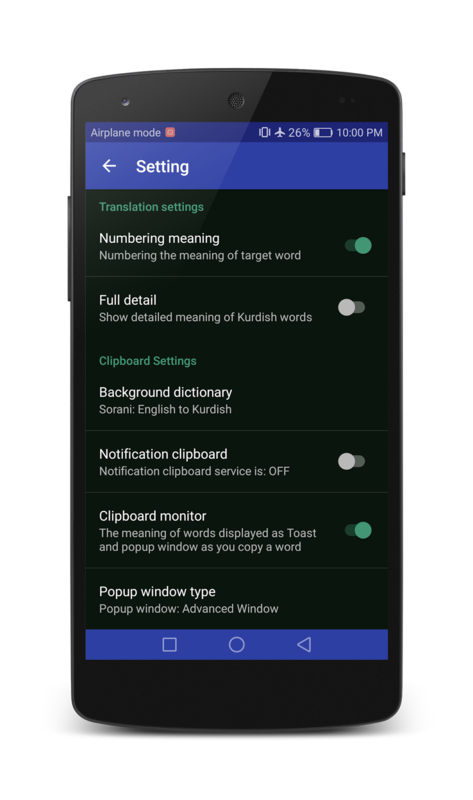 Kurdish to Arabic: 62,238 headwords. 5. Swedish to Kurdish: 61,000 headwords. 6. Kurdish to Swedish: 29,000 headwords. 7. Russian to Kurdish: 21,000 headwords. 8. Kurdish to Russian: 54,712 headwords. 9. 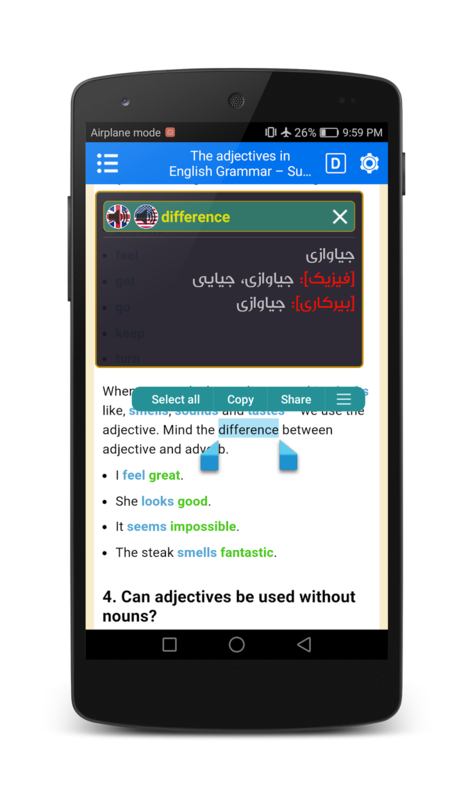 Persian to Kurdish: 44,177 headwords. 10. Kurdish to Persian: 41,231 headwords. 11. Turkish to Kurdish: 43,275 headwords. 12. Kurdish to Turkish: 41,338 headwords. 13. German to Kurdish: 45,000 headwords. 14. Kurdish to German: 43,325 headwords. 15. French to Kurdish: 45,848 headwords. 16. Kurdish to French: 43,488 headwords. 1. English to Kurdish: 6,300 headwords. 2. 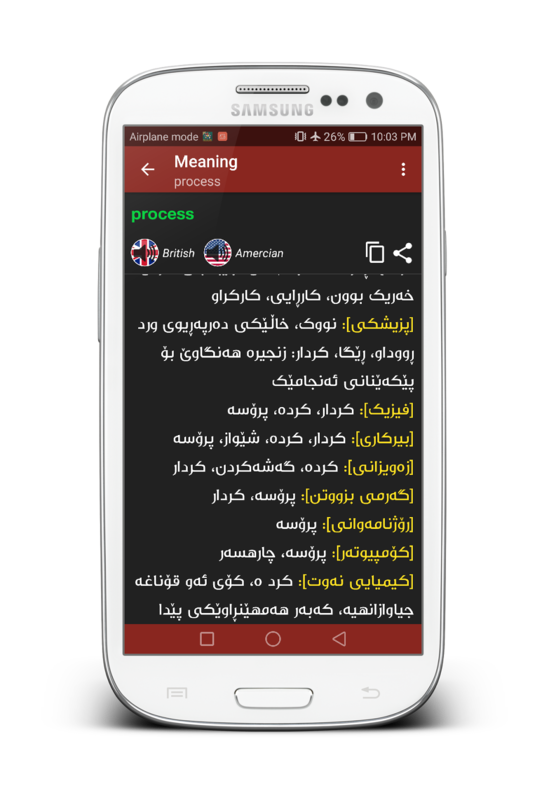 Kurdish to English: 5,820 headwords. 3. Arabic to Kurdish: 22,511 headwords. 4. Kurdish to Arabic: 25,500 headwords. 8. زیاتر لە 25 ڕووکاری ماتریاڵ و هۆلۆ. 1. ئینگلیزی بۆ کوردی: 6,300 سه‌رووشە. 2. کوردی بۆ ئینگلیزی: 5,820 سه‌رووشە. 3. عەرەبی بۆ کوردی: 22,511 سه‌رووشە. 4. کوردی بۆ عەرەبی: 25,500 سه‌رووشە.